Example of Bank of 10 front opening aluminium letterboxes, with a stainless steel sign above. This bank is 5 boxes wide x 2 boxes high. Individual box is 350mm wide x 175mm high x 250mm deep. Banks can be customized to your needs. You can have more or less than this example. First of all customers, the STAINLESS STEEL SIGN and ALUMINIUM LETTERBOXES is an example, of a Bank of 10 front opening Aluminium flush mounted letterboxes, with a sign. The individual mailbox however is 350mm wide x 175mm high x 250mm deep, which is suitable for brick work. You can also have this arrangement in 390mm wide x 200mm high x 200mm deep, which is suitable for block work. Customers can have this design in whatever layout or design they want. 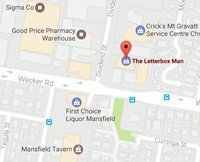 The Letterbox Man can help with designing the layouts for you. Furthermore it should be noted that the mail slot of the bottom letterbox should be no lower than 600mm from the ground and the top mail slot no more than 1600mm from the ground. This is an Australia Post requirement. In conclusion Purchasers can also have a 316 Marine Grade Stainless steel sign made up to their size and requirements. Finally we use heavy duty 1.6-2mm Australian grade aluminium for construction of our letterboxes. For strength and rigidity we have internal welded sections. A further feature of our letterboxes is burglar resistant partitions between door opening along with recessed doors.